The most important tool in a job search is your resume, yet it is also perhaps the most misunderstood. 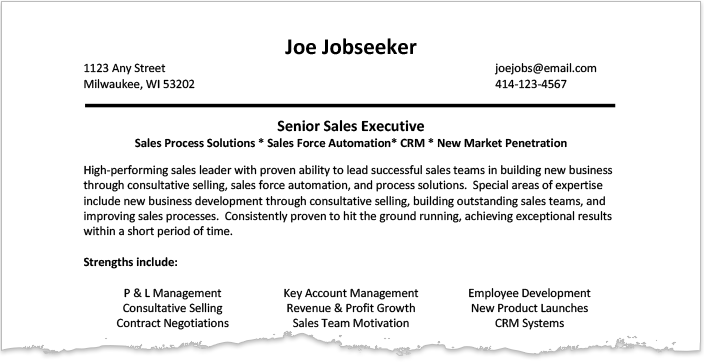 A resume is a job seeker’s marketing tool while the application form is the employer’s filtering tool. Having a great resume is essential in a job search – it’s the primary means of presenting yourself as the most qualified person for the job. If you are exploring two different occupations, consider creating two resumes and customize each resume to highlight your relevant experiences and skills. Use a resume format that is professional and appropriate for business. 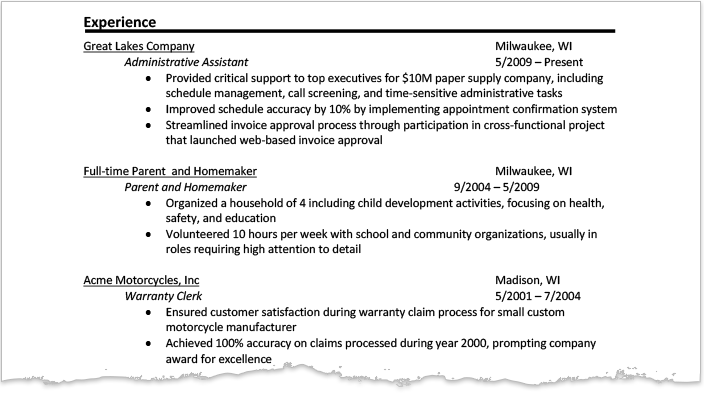 Resumes do not have a standard format, but there are three common ways to organize the information. Chronological – List your work experience and education in reverse chronological order. The experience you gained at each job is associated with that job on the resume. Functional – List experience and education separate from work history. Work experience is grouped together by category, while your work history (e.g. dates of employment, title, etc.) is listed separately at the bottom or may not be listed at all. Combined – List skills and major accomplishments at the top. Work history should always be listed in reverse chronological order. The top of the resume should include your name, address, email address, and telephone number. The arrangement of these details is up to you, but make sure it looks clean and easy to read. The top section of the resume can be a profile, objective, or skills summary. Any of these are fine, but it’s important that this section adds some value to the resume. If you feel it’s not adding to your resume, feel free to omit it. The most traditional format includes stating an objective. The objective can be useful on generic resumes that are submitted to resume databases or widely distributed to let an employer know what type of position you’re looking to secure. An objective is less useful for a targeted resume that is submitted for a specific job. In this case, it is more appropriate to use a profile. The profile is a high-level overview of your background in 1-3 sentences that focuses on the value you can add to the organization. The goal is to grab the reader’s interest in continuing to read your resume and qualifications. Obviously, customizing your profile to relate to the skill set in the position will be beneficial to your application. It’s useful to have a few profile statements that you typically use and modify these to fit the job. Finally, some choose to use the top section as a summary of relevant knowledge, skills, and abilities, creating what we call a "combined" resume format. This section will likely push your resume beyond one page, so you will have to be comfortable with that. This is common on resumes for executive and professional level positions. Typically, the next section on your resume would list your employment experience, unless your education background is more impressive than your work history and matters more to the job you are applying for. Experience should be listed in reverse chronological order, using a consistent format. Always include dates of employment, company name and location, and your job title(s). Keep formatting consistent with your use of bold, underlined, and italicized words. If you have had many different positions in the same company, list the job titles and dates you served in each position under the company heading. List your education similar to the experience section. Be sure to list any awards or honors as well. You should also list certifications or continuing education that are required or relevant to the job you are applying for. Sometimes, a final section may be needed to contain "miscellaneous" information that you feel is important to your qualifications for the job. You can title this in many ways, with common headings being, "Other Experience", "Additional Experience", "Relevant Skills", etc. Try to make your resume fit into one page as much as possible, but don’t be afraid to use a second page if you have quality content. Use bullets to highlight accomplishments and use white space to break up heavy blocks of text. Adjust font sizes and margins to make sure your resume is aesthetically pleasing.